A rise of some factor e.g. 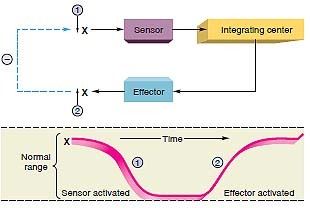 X of the internal environment is detected by the sensor. This information is relayed to the integrating center that causes the effector to produce a change in the opposite direction. The initial deviation is thus reversed, thus completing the negative feedback loop. The same holds true if the factor X is decreased. The integrating center detects a change from the set point and causes necessary effects to bring it back to normal. 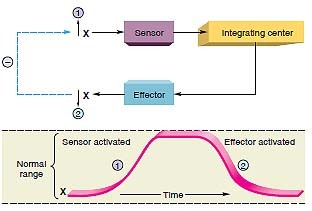 Below is a diagram that shows negative feedback loops maintain a state of dynamic consistency within the internal environment.